I have another springtime House Mouse card this week. This little House Mouse looks comfy napping on his ducky friend, on a nice warm lazy day. 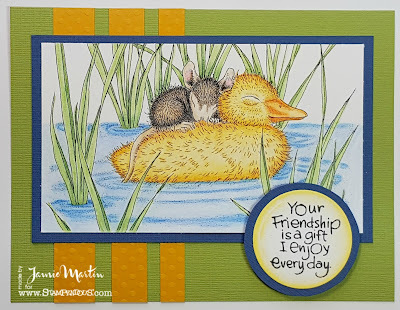 Several other Stampendous Designers are sharing their creations today so be sure to go over the Stampendous Blog for their links. 1. Stamp Ducky Nap on a white panel with black ink and color duck with watercolor pencils and everything else with colored pencils. Once the duck is dry, shade with colored pencils. 2. Layer onto blue paper and set aside. 3. Cut strips of yellow paper, glue to a green card and mount Ducky Nap. 4. Stamp sentiment on a white circle, layer it onto a larger blue circle and pop up on card as shown. Duck nap is such a sweet image and love your fabulous coloring and card design! This is just so sweet and cute!! !